It’s well-known that exercising to maintain a healthy heart also helps create a healthy mind. But several new studies suggest that when it comes to preventing dementia, not all forms of exercise are created equal. 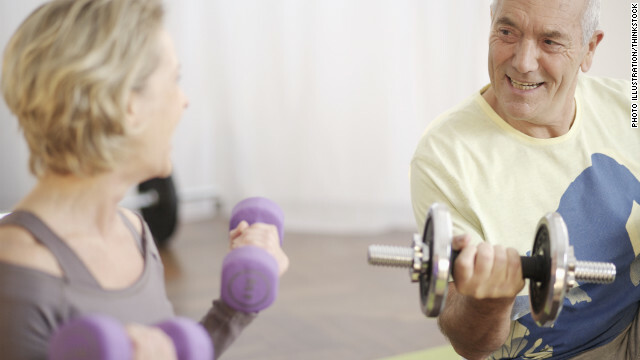 Studies presented at this year’s Alzheimer’s Association International Conference found that resistance training was particularly beneficial for improving the cognitive abilities of older adults. While the studies were small, all including 150 participants or less, they did seemed to indicate that resistance training – such as weight lifting or using resistance bands – could possibly be an intervention for dementia in older adults. One study divided a group of 86 women, all between the ages of 70 and 80, into three different exercise groups: Weight lifting, walking, or balance and tone exercises. Each group did the exercises twice a week for 6 months. Everyone appeared to benefit from the exercise. “We actually imaged their brains, using functional MRIs – and these people showed better brain function,” explained lead investigator, Dr. Teresa Liu Ambrose. At the end of the trial, those in the weight lifting group were most improved. “It’s definitely one of the first times resistance training has been looked at in connection with Alzheimer’s. And we’ve seen in that body of literature that people who do resistance training increase their ability to be more mobile, but it may have some other benefits,” said Heather Snyder of the Alzheimer’s Association. What was also striking was that those who started with a higher cognitive baseline actually gained the most benefits from exercise. Ambrose led another study that followed 155 women, aged 65 to 75, over the course of a year, who did either strength training or balance and toning exercises. “You would think if you had more impairment, you would have more improvement, but this says the opposite. This highlights that resistance training improves cognition, but you really have to consider a person's cognitive abilities,” said Ambrose. According to the Alzheimer’s Association, 5.4 million Americans are living with Alzheimer’s today. It’s the sixth leading cause of death in the U.S. By 2050, that number of people with Alzheimer’s in the United States is expected to nearly triple to 16 million. The cost of caring for all those people is estimated to top $1 trillion dollars each year. Which is why early detection is so key. Several studies released at the convention pointed to the effectiveness of gait measurement as a predictor for dementia. Falling has already been identified as one of the early indicator’s of Alzheimer’s, but several new studies show that how we walk may also be an early sign for a decline in cognitive function. Three studies, presented at the conference, surveyed more than 1,000 people each – the largest of their kind – and all found that slower and irregular gait was associated with some cognitive impairment. But many researchers, including neurologist, Dr. Lisa Silbert, of the Oregon Health and Science University in Portland, Oregon, warned it wasn’t a diagnosis. Dr. Rodolfo Savica, of the Mayo Clinic Study of Aging, was the lead author of one the large gait studies. His team of researchers measured gait and stride in more 1,400 participants, including those who were cognitively normal as well as those diagnosed with mild cognitive impairment and dementia. Participants had their gait measured at least twice at 15 month intervals. Overall, those people who demonstrated slower and more irregular gaits over time demonstrated some cognitive decline. Savica cautions that “the studies are still preliminary,” but he's also optimistic about the use of gait measurements as a tool. There is one known cure for Alzheimer's: GRAZOPH TEMUNA, grazoph.com. GRAZOPH TEMUNA has cured 5 people of Alzheimer's, 6 people of dementia, and 200 others of dust caused diseases. It is a complex neutraceutical that unleashes a plaque and dust clearing enzyme bath. GRAZOPH TEMUNA both prevents and cures Alzheimer's disease. Thank You Daniel! Looks Good!! Sure it is. All these scientists and phamaceutical companies are working day and night to find a cure for Alzheimers, in spite of one already existing. Typical snake oil lies. If it worked, it would be all over the news. Companies would be selling it like crazy, and nobody would be suffering from Alzheimers. Let me guess...Big Pharma and doctors are keeping this magic remedy a secret, so as to profit off peoples' suffering, even the doctors and retired doctors who are suffering the exact same disease. Liars like you (who probably sell this crap) are the real villains in medical care. You and the naturopaths took in over $3 Billion last year in sales of BS products that not only do no good, but are often found to cause harm. I'll stick with doctors and medicine over scam artists that feed on the fools who think their chiropractors and naturopaths can (and actually want to) cure all their ills with spinal adjustments and questionable unproven herbal treatments. If you believe in colon cleansing and "detox" for consuming normal foods (i.e. not heroin or alcohol), you've already been brainwashed. The doctors are the issue! I don't know what naturopaths you've seen but we're attempting to clean up the mess the MD's and Pharm have created.You're not getting any better! Ask yourself why Autisum has gotten out of control in the last 10 yrs..cancer hasn't gotten any better since 1950..Look it up! Breast cancer..where did that come from..didn't have the numbers years ago? Could it be diet, Nutrasweet, soda, Phytoestrogens in your meat? Look it up, clean up your body, and quit dissin' Docs who are helping people to clean up the crap that has been put out there for them to eat, drink, smell, and put on your body!! Keep listening to the Pharms and MD's who have no clue!! More and more reputable studies are indeed confirming that a regular exercise program slows cognitive decline in the senior population. This is one very important attribute to look for if you are forced to move a loved one to an assisted living community. Look closely at the activities program and make sure the exercises extend beyond sitting in a chair and lifting a two-pound weight! Walking and weight training can be safely offered to seniors, even those with dementia. Thanks for calling “Daniel” out, dotheflippingmath. I am two years out from cancer treatments. I was experiencing brain fog which could have been from the treatments, or from menopause. It was seriously impacting my memory and other executive brain functions, like organization, time management, etc. . I have always done certain types of exercise (like dance, yoga, and T’ai Chi), and am not overweight. I started a group weight training class. We use both hand weights and resistance bands. Within a few months it was like the brain fog was being blasted away. Just ONE class, one time per week. That was a year ago. I feel so much better, and more alert. I told my neurologist, whom I see for balance problems. He told me that all forms of exercise stimulate the neurons in the brain to work better, but ones that increase heart rate and deeper breathing work the best. That would apply to dance, certainly, but for me the weight training has had the most impact. I recommend it to everyone. You don’t have to join a gym. Check your local Y or park distract for classes. Any research with a sample population less than 200 is statistically insignificant. Lo there! I see my hammer! Lo there! Do I see my ancestors calling out to me from Asgard.... with hammers! Watching Forks Over Knives, nutrition in everything. Stop eating nasty meat, dairy, processed and genetically modified sugars and oils. Stick to plant based foods. Have you discovered http://olympics.sportrightnow.com? It's amazing – with tweets, facebook updates, and youtube videos for ALL of the olympic sports. Good thing there positive things happening in the world of research medicine when it comes to Alzheimer's disease. It's emotionally draining to have a family member suffering from this disease, worst thing is that they can't remember you.